The game between Top Four teams took place in Ulsan. First ranked host Mobis Phoebus (30-10) smashed 3rd ranked KT Sonicboom (22-17) 95-72. It ended at the same time the two-game winning streak of KT Sonicboom. Mobis Phoebus dominated down low during the game scoring 66 of its points in the paint compared to KT Sonicboom's 42. They looked well-organized offensively handing out 27 assists comparing to just 12 passes made by KT Sonicboom's players. The former international forward Ricardo Ratliffe (203-89, college: Missouri) had a double-double by scoring 35 points (!!! ), 19 rebounds and 5 assists to lead the charge for the winners and American guard Shannon Shorter (193-89, college: N.Texas) chipped in 16 points, 5 rebounds and 5 assists during the contest. The best for the losing side was Dominican guard Joel Hernandez (190-95, college: LIU Brooklyn) with 19 points and 5 rebounds. The winner was already known earlier in the game, so both coaches allowed to play the bench players saving starting five for next games. Mobis Phoebus maintains first position with 30-10 record. KT Sonicboom at the other side keeps the third place with 17 games lost. Mobis Phoebus are looking forward to face KCC Egis (#5) in Jeonju in the next round. KT Sonicboom will play at home against LG Sakers and it may be a tough game between close rivals. The game in Daegu was also worth to mention about. 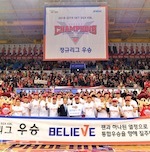 Second ranked ET Land Elephants (26-13) played at the court of 7th ranked Goyang Orions (20-20). ET Land Elephants managed to secure a 6-point victory 95-89. American guard Giddy Potts (188-95, college: Middle Tenn.St.) notched 27 points, 6 rebounds and 4 assists (went 8 for 8 at the free throw line) to lead the effort and Charles Rhodes supported him with 14 points and 10 rebounds. ET Land Elephants' coach Yoo Hoon allowed to play the deep bench players saving starting five for next games. Even a double-double of 18 points, 14 rebounds and 7 assists by American power forward Darryl Monroe (201-86, college: George Mason) did not help to save the game for Goyang Orions. ET Land Elephants have a solid three-game winning streak. They maintain second position with 26-13 record having five points less than leader Mobis Phoebus. Goyang Orions at the other side dropped to the fifth place with 20 games lost. They share the position with KCC Egis. ET Land Elephants will play against Anyang KGC (#8) on the road in the next round where they are favorite. Goyang Orions will play against DB Promy and it may be a tough game between close rivals. 6th ranked DB Promy (19-21) was outscored at home by eighth ranked Anyang KGC (18-22) with the biggest margin this round 102-71 on Sunday night. The best player for the winners was Justin Edwards who scored 38 points (!!! ), 5 rebounds and 4 assists. At the other side the best for losing team was Marcus Foster who recorded 28 points and 4 assists. Since the result was very predictable, it gave the chance for the coaches to test many bench players which allowed the starters a little rest for the next games. Anyang KGC maintains eighth position with 18-22 record. Loser DB Promy dropped to the seventh place with 21 games lost. Anyang KGC will meet at home league's second-placed ET Land Elephants in the next round and they do not belong to the favorites in that game. DB Promy will play against Goyang Orions (#6) in Daegu and it may be a tough game between close rivals. There were no shocking results in the other games in round 30: DB Promy won against Samsung Th. on the opponent's court 79-74. LG Sakers managed to outperform KCC Egis in a home game 97-91. Bottom-ranked Samsung Th. recorded a loss to ET Land on the road 84-78. SK Knights was defeated by Goyang Orions on its own court 86-91. The most impressive stats of the last round was 31 points, 10 rebounds and 8 assists by Aaron Haynes of SK Knights. The game in Daegu was also worth to mention about. 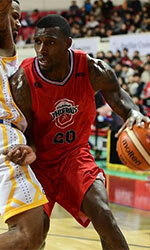 Second ranked ET Land Elephants (26-13) played at the court of 7th ranked Goyang Orions (20-20). ET Land Elephants managed to secure a 6-point victory 95-89. ET Land Elephants made 17-of-21 charity shots (81.0 percent) during the game. Goyang Orions were plagued by 24 personal fouls down the stretch. American guard Giddy Potts (188-95, college: Middle Tenn.St.) notched 27 points, 6 rebounds and 4 assists (went 8 for 8 at the free throw line) to lead the effort and the other American import power forward Charles Rhodes (203-85, college: Mississippi St.) supported him with 14 points and 10 rebounds. ET Land Elephants' coach Yoo Hoon allowed to play the deep bench players saving starting five for next games. Even a double-double of 18 points, 14 rebounds and 7 assists by American power forward Darryl Monroe (201-86, college: George Mason) did not help to save the game for Goyang Orions. The former international power forward Jin-Soo Choi (202-89, college: Maryland) added 17 points, 5 rebounds and 4 assists. Four ET Land Elephants and five Goyang Orions players scored in double figures. ET Land Elephants have a solid three-game winning streak. They maintain second position with 26-13 record having five points less than leader Mobis Phoebus. Goyang Orions at the other side dropped to the fifth place with 20 games lost. They share the position with KCC Egis. ET Land Elephants will play against Anyang KGC (#8) on the road in the next round where they are favorite. Goyang Orions will play against DB Promy and it may be a tough game between close rivals. Very expected game in Seoul where 10th ranked Samsung Thunders (10-30) were defeated by sixth ranked DB Promy (19-21) 79-74 on Friday. DB Promy outrebounded Samsung Thunders 41-28 including 31 on the defensive glass. The best player for the winners was American power forward Leon Williams (203-86, college: Ohio) who had a double-double by scoring 26 points and 19 rebounds (on 9-of-10 shooting from the field). The other American import guard Marcus Foster (190-95, college: Creighton, agency: Pensack Sports) chipped in 30 points, 9 rebounds and 4 assists. At the other side the best for losing team was American guard Nate Miller (193-87, college: Bowling Green) who recorded a double-double by scoring 17 points and 11 rebounds and the former international center Jun-Yl Kim (202-92) added 13 points and 10 rebounds respectively. Four Samsung Thunders players scored in double figures. Both coaches used bench players in such tough game. Despite that victory DB Promy went down to seventh position due to points difference. Samsung Thunders lost fifth consecutive game. They stay dead last with 30 lost games. DB Promy will meet higher ranked Goyang Orions (#6) in the next round and it may be quite challenging game. Samsung Thunders' supporters look forward to an exciting derby game next round, where their team will face at home their local rival from Seoul SK Knights. The game between Top Four teams took place in Ulsan. First ranked host Mobis Phoebus (30-10) smashed 3rd ranked KT Sonicboom (22-17) 95-72. It ended at the same time the two-game winning streak of KT Sonicboom. Mobis Phoebus dominated down low during the game scoring 66 of its points in the paint compared to KT Sonicboom's 42. They looked well-organized offensively handing out 27 assists comparing to just 12 passes made by KT Sonicboom's players. The former international forward Ricardo Ratliffe (203-89, college: Missouri) had a double-double by scoring 35 points (!!! ), 19 rebounds and 5 assists to lead the charge for the winners and American guard Shannon Shorter (193-89, college: N.Texas) chipped in 16 points, 5 rebounds and 5 assists during the contest. Four Mobis Phoebus players scored in double figures. The best for the losing side was Dominican guard Joel Hernandez (190-95, college: LIU Brooklyn) with 19 points and 5 rebounds and American forward Marcus Landry (201-85, college: Wisconsin) scored 20 points and 5 rebounds. The winner was already known earlier in the game, so both coaches allowed to play the bench players saving starting five for next games. Mobis Phoebus maintains first position with 30-10 record. KT Sonicboom at the other side keeps the third place with 17 games lost. Mobis Phoebus are looking forward to face KCC Egis (#5) in Jeonju in the next round. KT Sonicboom will play at home against LG Sakers and it may be a tough game between close rivals. The game between closely ranked teams ended with fourth ranked LG Sakers' (21-18) home victory over 5th ranked KCC Egis (20-20) 97-91 on Saturday. LG Sakers dominated down low during the game scoring 62 of its points in the paint compared to KCC Egis' 32. LG Sakers had a 19-5 advantage in offensive rebounds. The best player for the winners was Central African-American power forward James Mays (205-86, college: Clemson) who had a double-double by scoring 25 points and 20 rebounds. The former international forward Sung-Min Cho (197-83) chipped in 21 points, 5 rebounds and 4 assists. Five LG Sakers players scored in double figures. At the other side the best for losing team was American Brandon Brown (201-85, college: CS San Bernar.) who recorded a double-double by scoring 26 points, 11 rebounds and 5 assists and the former international forward Jung-Hyun Lee (191-87) added 19 points and 7 assists respectively. LG Sakers have an impressive six-game winning streak. They maintain fourth position with 21-18 record. Loser KCC Egis keep the fifth place with 20 games lost. They share the position with Goyang Orions. LG Sakers will meet higher ranked KT Sonicboom (#3) in the next round and it may be the game of the week. KCC Egis will play against the league's leader Mobis Phoebus in Ulsan and hope to secure a win. 6th ranked DB Promy (19-21) was outscored at home by eighth ranked Anyang KGC (18-22) with the biggest margin this round 102-71 on Sunday night. Anyang KGC dominated down low during the game scoring 64 of its points in the paint compared to DB Promy's 34. Anyang KGC forced 20 DB Promy turnovers and outrebounded them 45-32 including 18 on the offensive glass. The best player for the winners was Canadian guard Justin Edwards (190-92, college: Kansas St.) who scored 38 points (!!! ), 5 rebounds and 4 assists. Guard Byeon Junhyeong (186-96) chipped in 15 points and 4 assists. At the other side the best for losing team was American guard Marcus Foster (190-95, college: Creighton, agency: Pensack Sports) who recorded 28 points and 4 assists and his fellow American import power forward Leon Williams (203-86, college: Ohio) added 8 points and 11 rebounds respectively. Since the result was very predictable, it gave the chance for the coaches to test many bench players which allowed the starters a little rest for the next games. Anyang KGC maintains eighth position with 18-22 record. Loser DB Promy dropped to the seventh place with 21 games lost. Anyang KGC will meet at home league's second-placed ET Land Elephants in the next round and they do not belong to the favorites in that game. DB Promy will play against Goyang Orions (#6) in Daegu and it may be a tough game between close rivals. Not a big story in a game in Inchon where 10th ranked Samsung Thunders (10-30) were defeated by second ranked ET Land Elephants (26-13) 84-78 on Sunday. However just six-point win is not that big difference and the fans of host team counted on more convincing victory. The best player for the winners was American power forward Charles Rhodes (203-85, college: Mississippi St.) who had a double-double by scoring 19 points and 10 rebounds (perfect from the field making all six shots). The other American import guard Giddy Potts (188-95, college: Middle Tenn.St.) chipped in 14 points and 6 rebounds. At the other side the best for losing team was the former international center Jun-Yl Kim (202-92) who recorded a double-double by scoring 17 points and 14 rebounds and guard Gi-Beom Cheon (187-94) added 14 points and 4 assists respectively. Both teams had four players each who scored in double figures. Samsung Thunders' coach rotated ten players in this game, but that didn't help. ET Land Elephants have a solid three-game winning streak. They maintain second position with 26-13 record having five points less than leader Mobis Phoebus. Samsung Thunders lost fifth consecutive game. They stay dead last with 30 lost games. ET Land Elephants will meet Anyang KGC (#8) on the road in the next round where they are favorite. Samsung Thunders' supporters look forward to an exciting derby game next round, where their team will face at home their local rival from Seoul SK Knights. Everything went according to plan in Seoul where seventh ranked Goyang Orions (20-20) beat 9th ranked SK Knights (12-27) 91-86 on Sunday. Goyang Orions looked well-organized offensively handing out 21 assists. The best player for the winners was American power forward Darryl Monroe (201-86, college: George Mason) who scored 19 points, 9 rebounds and 7 assists. Forward Do-Soo Kim (193-81) chipped in 17 points and 4 assists. At the other side the best for losing team was American forward Aaron Haynes (201-81, college: Boise St.) who recorded a double-double by scoring 31 points, 10 rebounds and 8 assists and international forward Youngjun An (195-95) added 9 points and 9 rebounds respectively. Five Goyang Orions and four SK Knights players scored in double figures. Both coaches used bench players in such tough game. Goyang Orions moved-up to fifth place, which they share with KCC Egis. Defending champion SK Knights keep the ninth position with 27 games lost. Goyang Orions will meet at home DB Promy (#7) in the next round. SK Knights' supporters look forward to an exciting derby game next round, where their team will travel locally in Seoul to the arena Samsung Thunders.